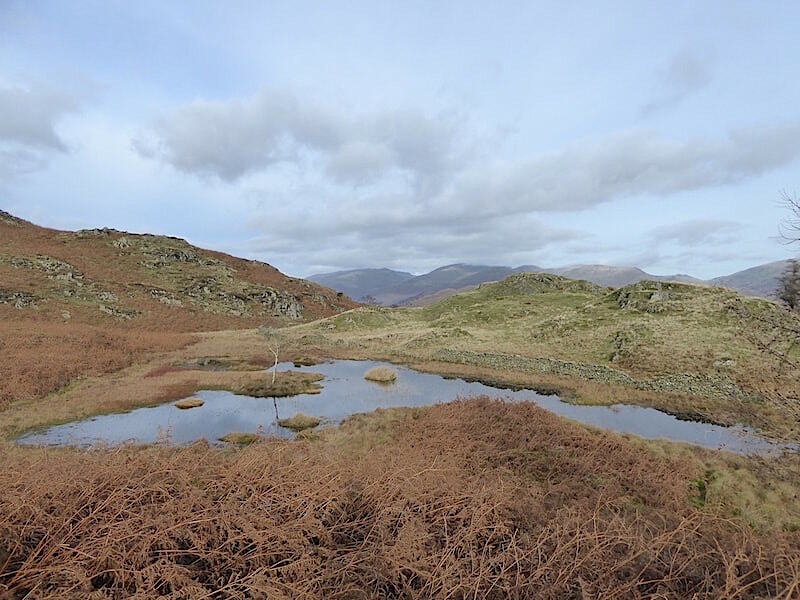 Knowing that the very cold and sunny morning was expected to turn cloudy from late morning onwards we decided to have just a short walk over Black Fell, do some exploring around the northern end of the fell and generally make the most of the sunny morning. 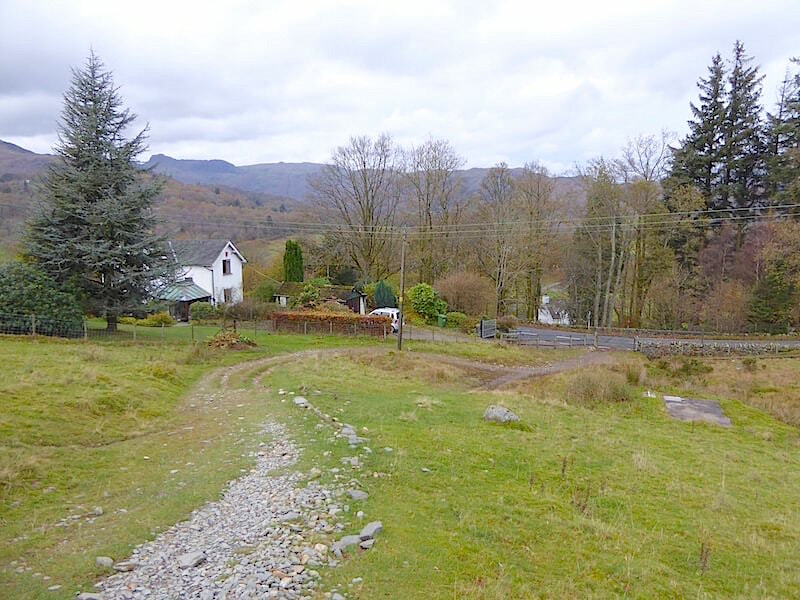 We expected to be in Skelwith Bridge, our starting point, around 9.15 a.m. but the best laid plans of mice and men …..
Just before we reached Glenridding we came to a halt at a stretch of roadworks on one of the bends along the lakeshore road. Two vehicles already waiting as we came to a halt, and others forming a queue behind us. As we were waiting, one of the workmen, in his bright yellow high-vis suit, came along to each car to notify us that he was very sorry but there would be a fifteen minute wait while the spoil was loaded. A big sigh accompanied this news and fingers began tapping the steering wheel. Once under way again we made our way through Patterdale and up the Kirkstone Pass, a glance to our right giving us a view of the light covering of snow which fell on some of the higher fells over there three days ago. 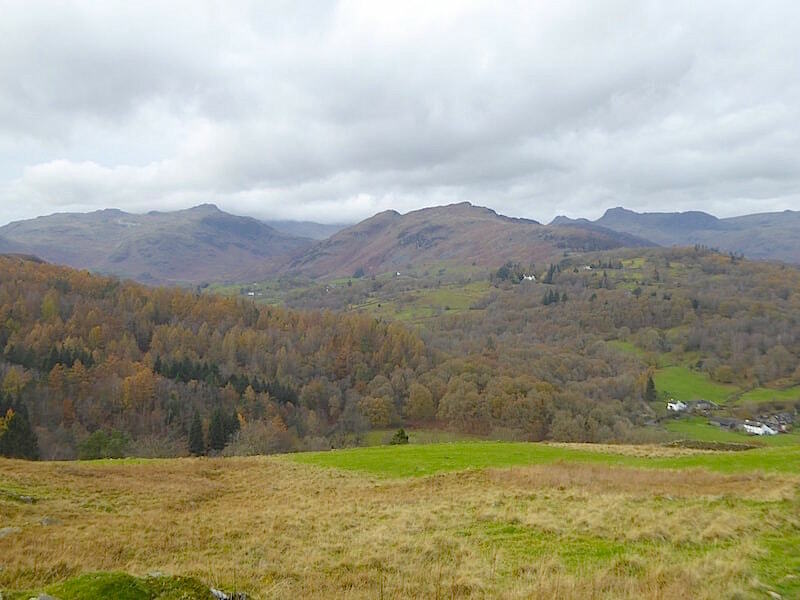 All went well until we reached the top of the pass, where we intended to take the right turn onto The Struggle which would drop us down into Ambleside, only to find a ROAD CLOSED notice at the turning. 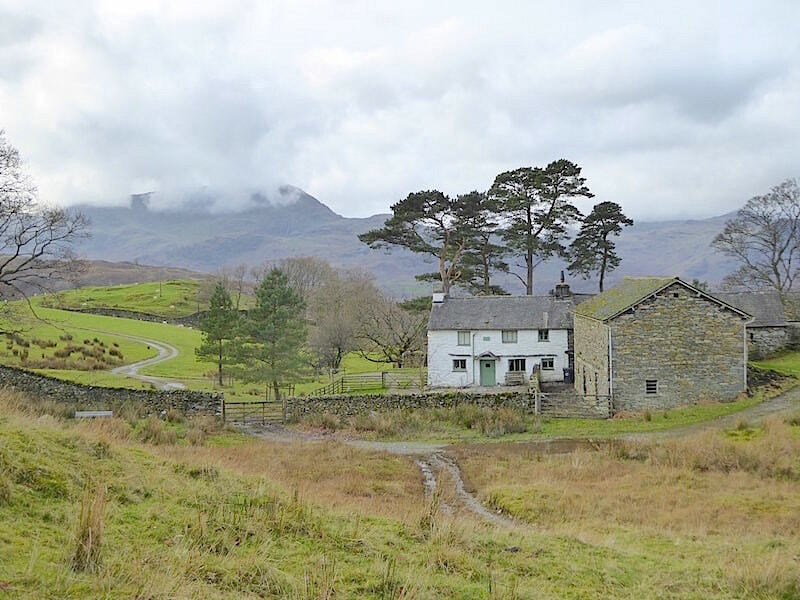 Now we have to take the detour down the Troutbeck road, accompanied by more sighs and agitation. Everyone’s using this road of course so there’s plenty of traffic which was headed up by a fuel tanker, behind which was a bin lorry, a few more cars and then us, plus the whole line of vehicles behind us. I thought it best not to mention, albeit jokingly, that the only vehicle missing was a tractor and trailer full of sheep. The sight of the fuel tanker and bin lorry had already given rise to much cursing as the cavalcade steadily made its way along and we eventually arrived at Skelwith Bridge a couple of minutes shy of 10.00 a.m. An extra forty five minutes of journey time when we could have been enjoying the crisp and sunny morning out on the fells. Through the trees the mist rises from the River Brathay as we get ready in the small car parking area at Skelwith Bridge. There aren’t many leaves left on the trees now but the bright sunlight is still providing a colourful enough scene. Across from the parking area is this row of cottages, unremarkable except for their particularly elaborate chimneys. Why so many I wondered? Short of knocking on one of the doors and asking the occupants I will remain ignorant as to the reason. Crossing the road bridge over the river with a view of the top of Loughrigg Fell peeping up above the layers of mist. Lots of mist everywhere this morning and I felt sorry for a couple of photographers who had set up close to the Duke of Portland boathouse at the Pooley Bridge end of Ullswater where you would generally see large amounts of it hovering above the water. 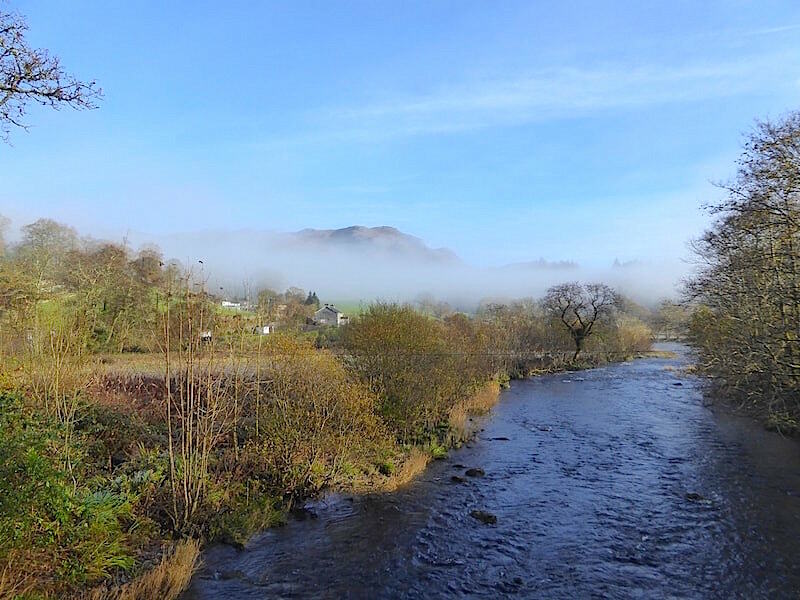 There wasn’t much at all there this morning, yet at the Glenridding end, where it is often clear when the Pooley Bridge end isn’t, the whole village was shrouded. Once across the bridge we continued straight on up the lane directly opposite it until we reached the village community hall and from there followed this narrow footpath through Brow Coppice. The narrow path climbs steadily and the spiders had been busy along here, creating long lines of silk across it from the trees on the left over to the bushes and shrubs on the right. We could see them strung out in the sunlight ahead of us all the way up and being so plentiful they were unavoidable, by the time we reached the little lane at the top we were well draped in the sticky strands. 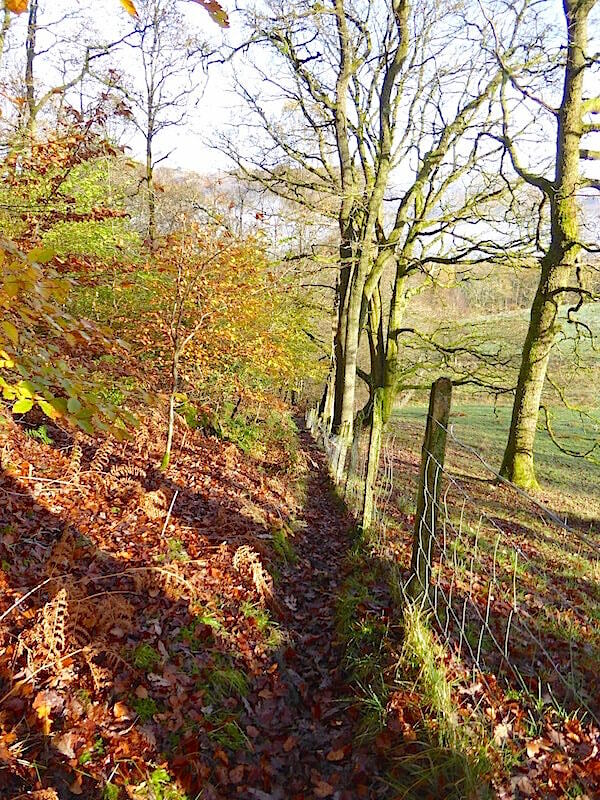 A look back down the path at the glorious colours in the strong autumn sunlight. 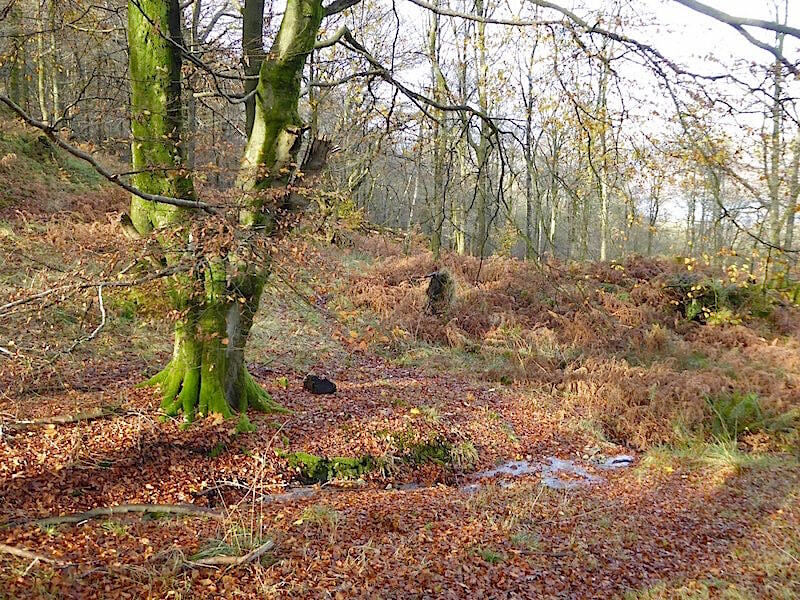 A clearing in the coppice where the sunlight was a little more muted as it filtered through the tree branches. 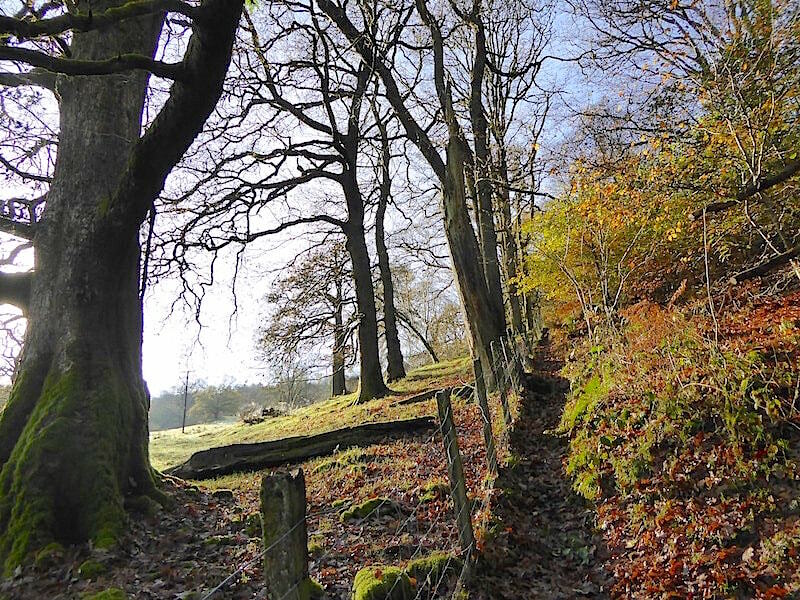 On the way up, where the path was largely in the shade, all the fallen leaves were crisp and frosted with a delicate layer of ice. 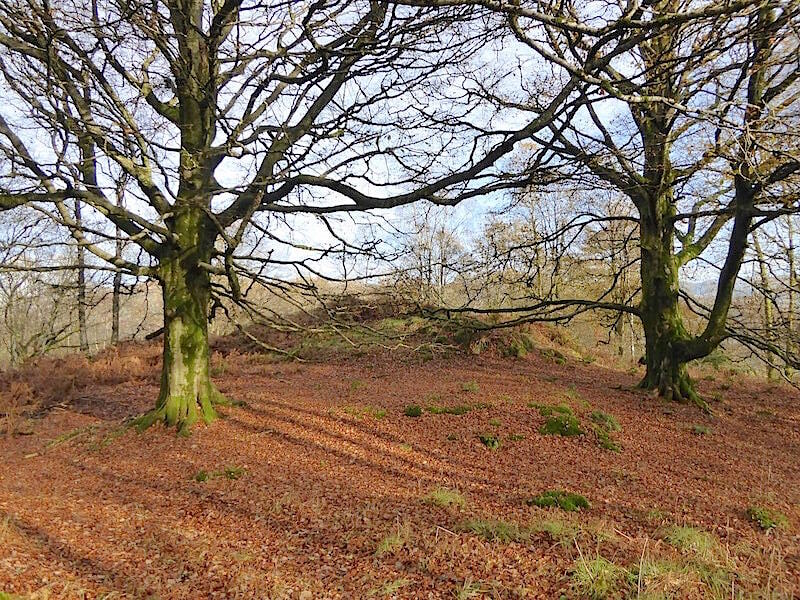 A little further on and another leaf strewn clearing where these two stately trees were dominating their surroundings. From this point we walk up the slope behind us and out onto the bracken covered open fellside. 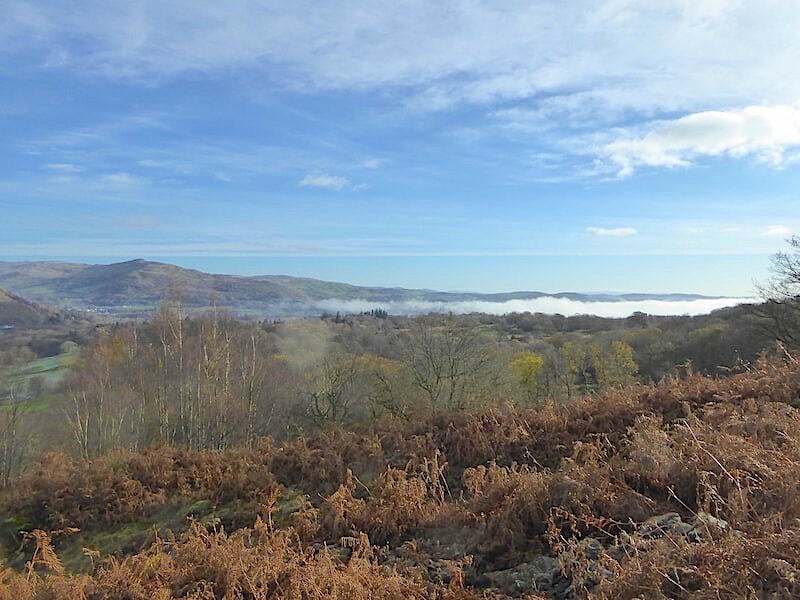 Once on the open fell our views become more extensive, on the left is Wansfell while on the right the mist inversion hangs thickly over Windermere. The bracken was so crisp that it crumbled quite readily beneath our feet. A leafless tree silhouetted against an increasingly clouded sky drifting in from the west and the mist still hanging over Windermere. 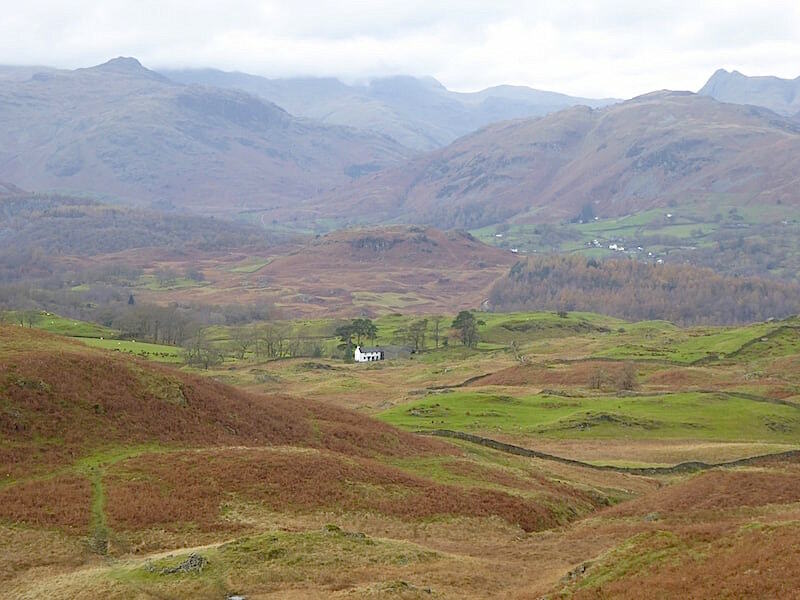 The paths over the open fellsides are intermittent, but it doesn’t really matter. 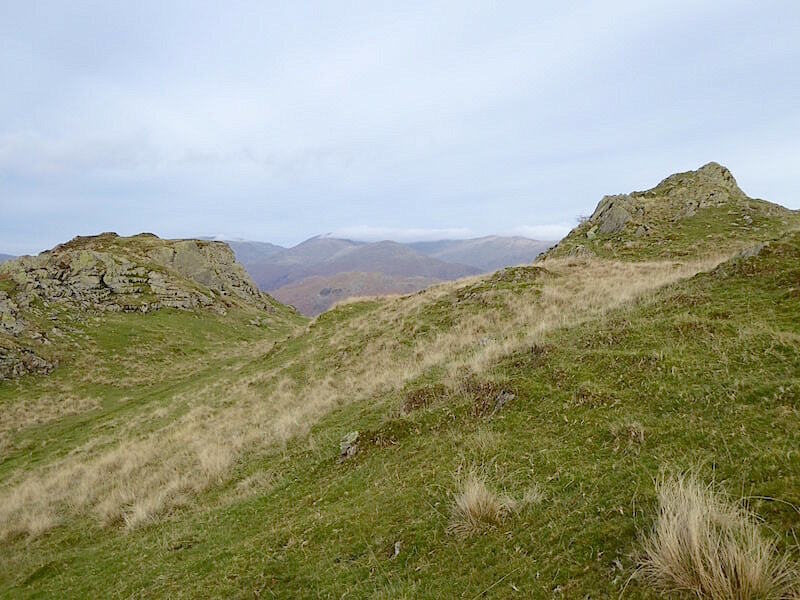 For the most part the ground is grassy and punctuated with an abundance of outcrops which you can skirt around or clamber over, and there’s nothing, other than the fairly stiffish climb, to get the heart racing. 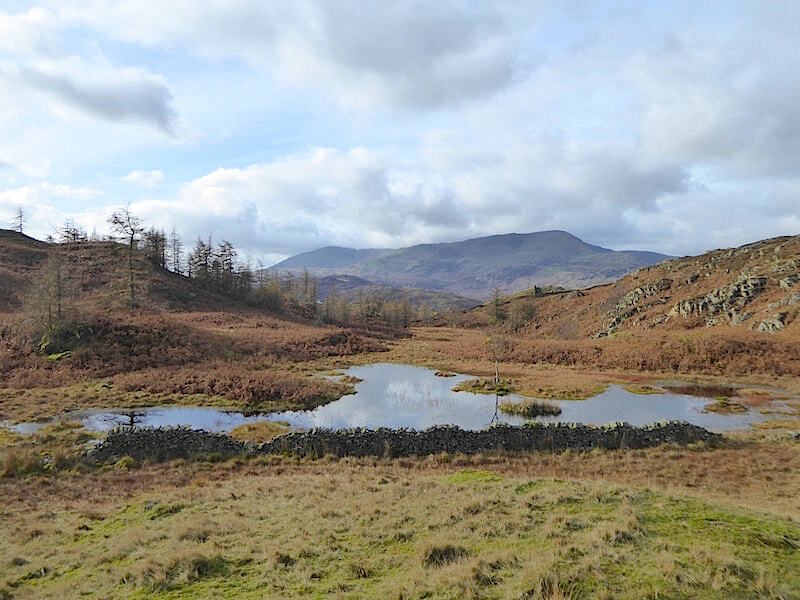 Eventually, at the crest of the hill, you arrive at Park Fell Tarn beyond which are Wetherlam and Coninston Old Man on the skyline. We had a short break here, and yes, the inevitable Mars Bar was rummaged for and subsequently enjoyed while we watched the clouds dappling the fells. After our break we spent some time enjoying the views from the two largish outcrops up here. 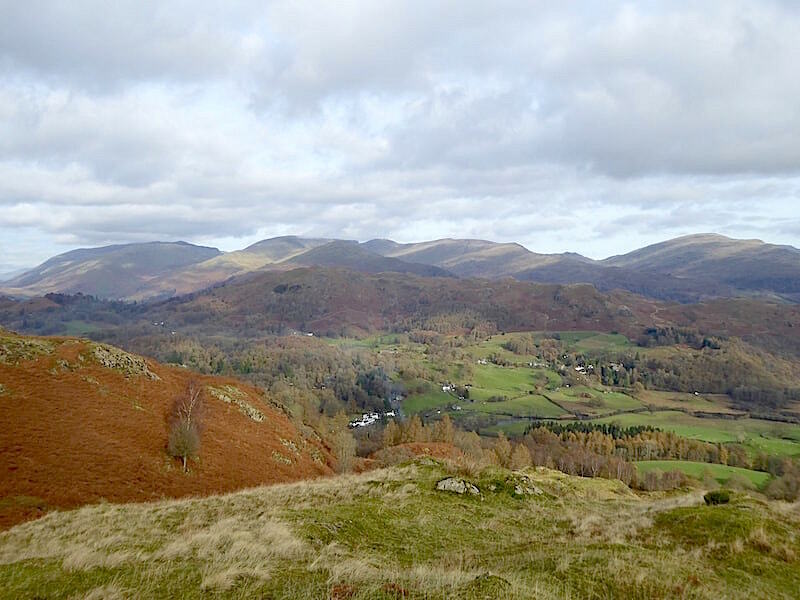 The cluster of white buildings directly below us are in Skelwith Bridge, across the middle foreground is the extensive expanse of Loughrigg Fell, while on the skyline beyond is the Helvellyn range, over on the left, pretty much all of the Fairfield Horseshoe, in the centre, with Red Screes over on the extreme right. Of course its all a bit muted now that the cloud has moved in, but its not too shabby a view for a relatively modest amount of effort. 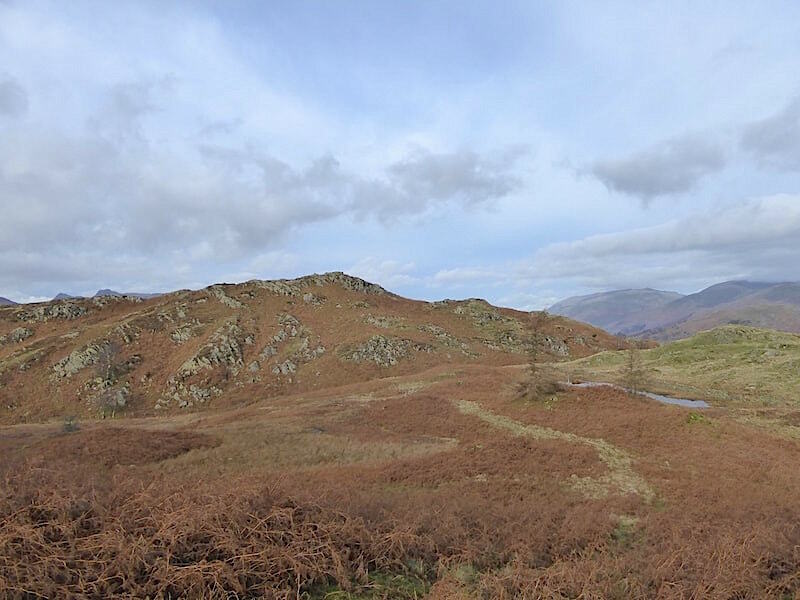 Having explored the two outcrops, which are out of shot to the left of the tarn, we made our way up to the top of Park Fell from where we had a view across the bracken of the network of pathways over to Black Fell. 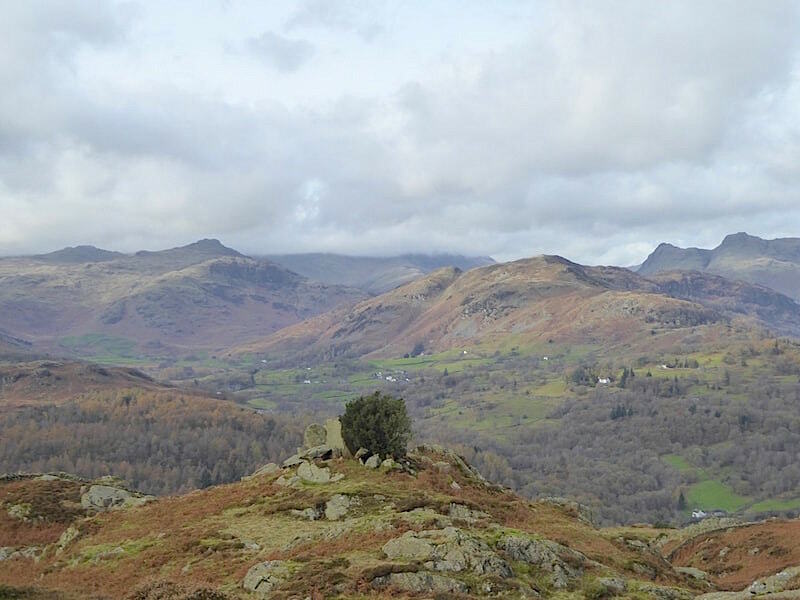 Its only a few minutes worth of climb up to the summit of Park Fell with this glimpse of the Langdale Pikes in the distance. 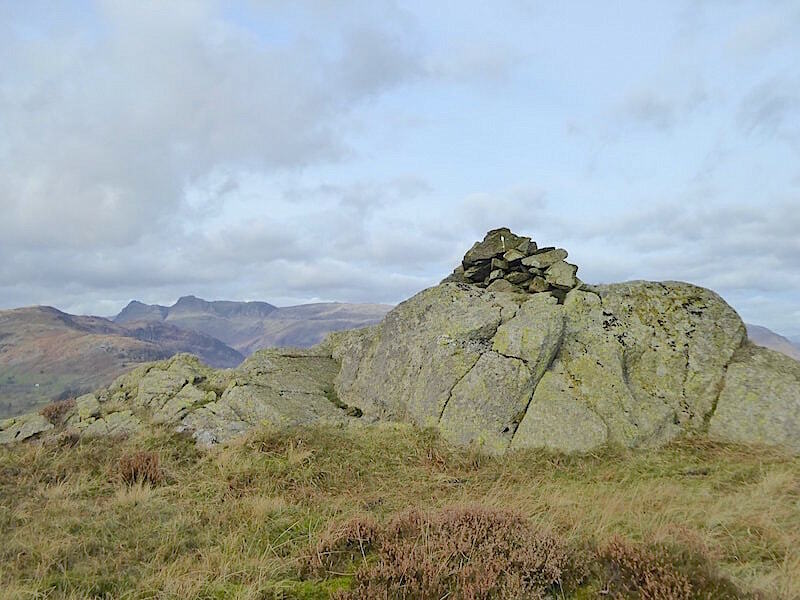 A little further to the left of the cairn with the Langdale Pikes now on the right of the shot, and Lingmoor Fell to the left of them. To the left of that Bowfell is just about obliterated by cloud but Pike O’Blisco and Cold Pike on the far left are clear enough. 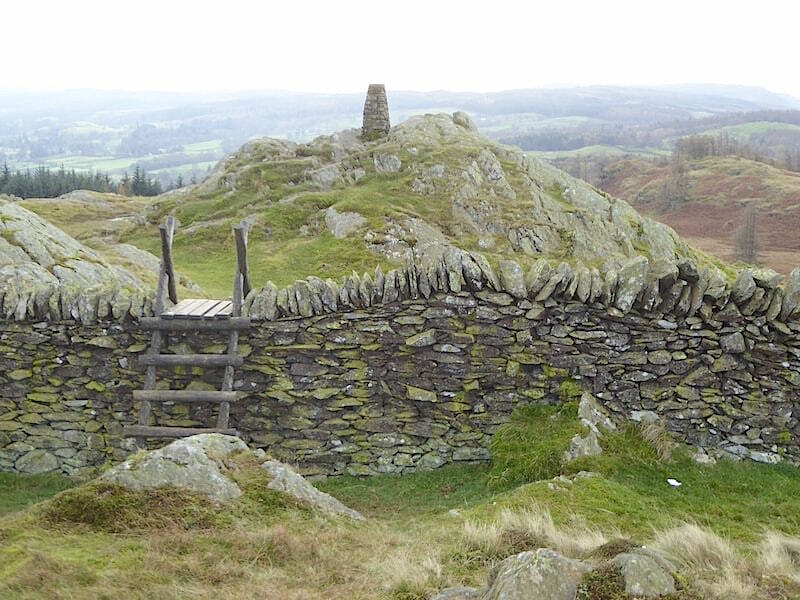 Below me, to the right of the cairn, you can see the thin path which brings you out onto this rough and craggy area at the top of the climb from Skelwith Bridge. 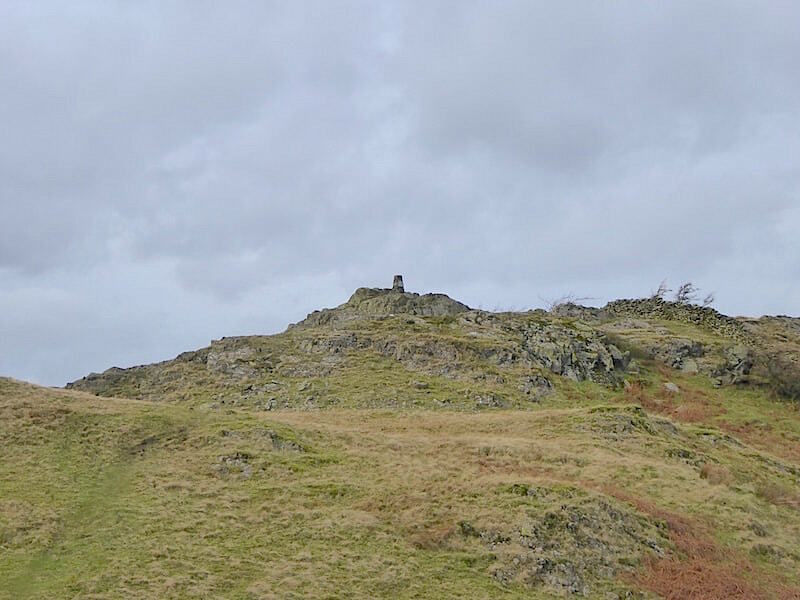 You can tell the steepish nature of the climb up, which has just the same type of terrain, by the way the path suddenly disappears, although its not quite the cliff edge kind of drop which it appears to be in the photo. 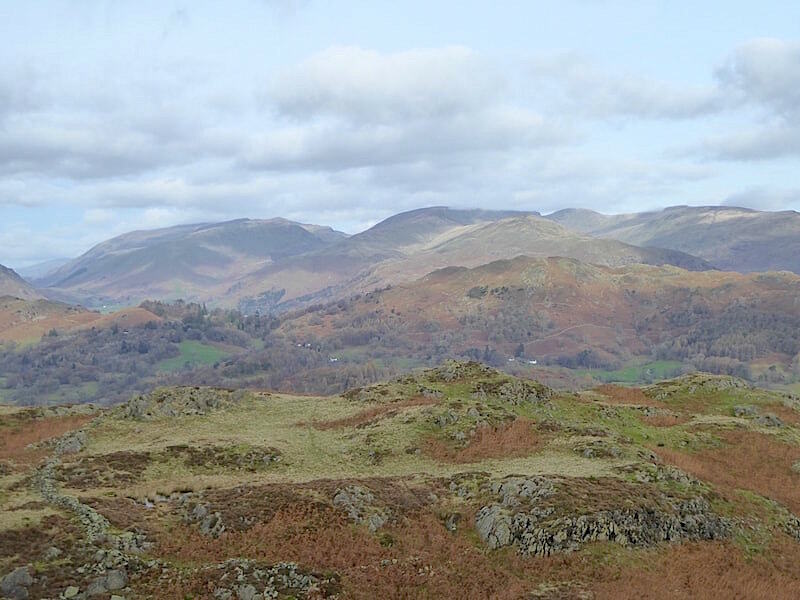 In the middle foreground is Loughrigg once again, behind which are the Helvellyn and Fairfield groups of fells. 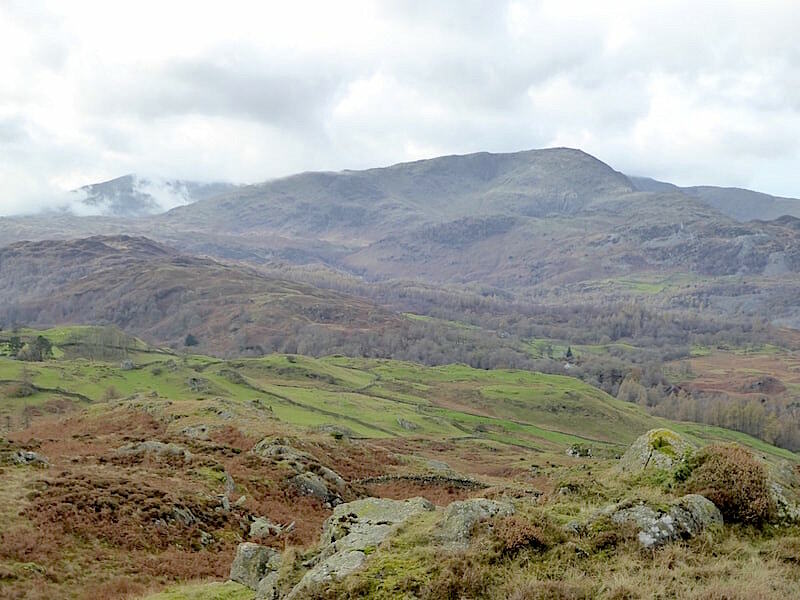 Looking south west, across the green area of High Arnside, the diminutive Holme Fell is being dwarfed by the mass of Wetherlam on the skyline. 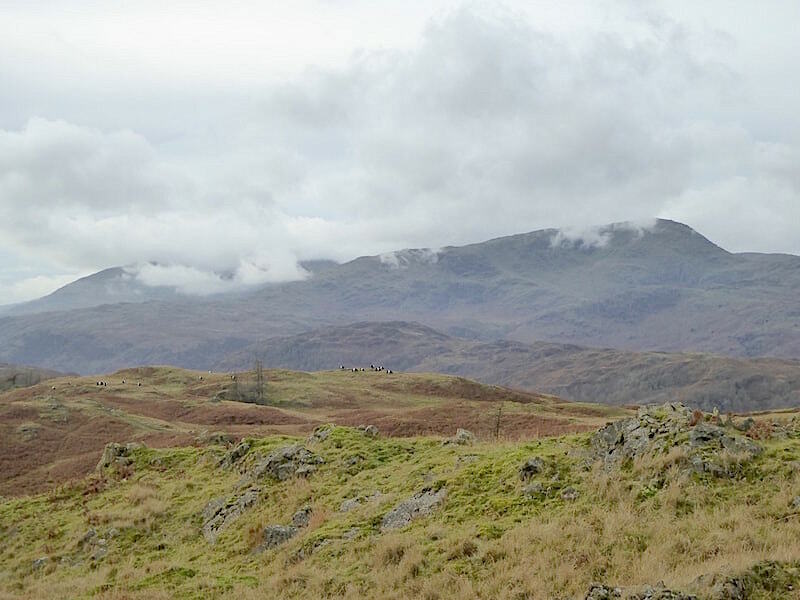 The cloud is thickening now and beginning to creep between Wetherlam and Coniston Old Man just behind it. The spells of sunshine are becoming much briefer now but the air is very still so there isn’t even a hint of a breeze up here. 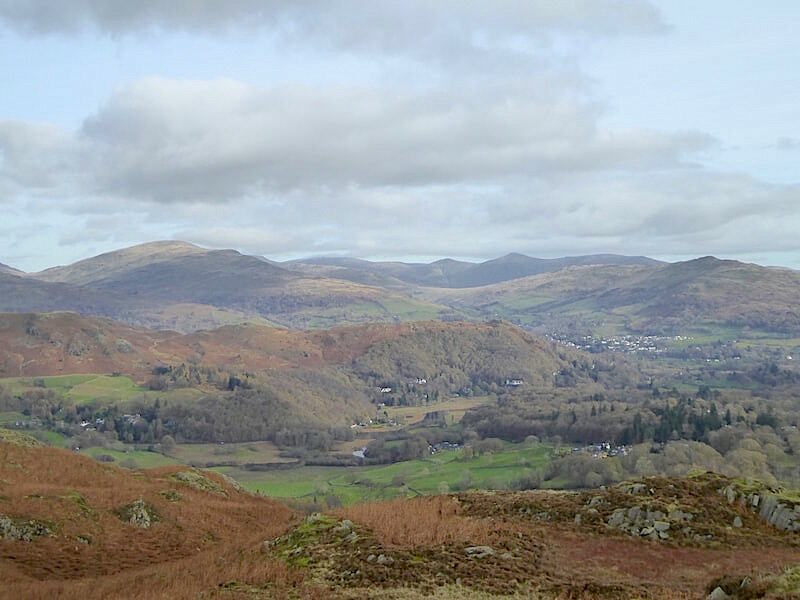 Over towards the east we still have the mass of Loughrigg Fell in the middle foreground and beyond it is Red Screes on the left, Wansfell on the right, and between them some of the fells of the Kentmere Horseshoe, the most prominent being the two pointy ones of Froswick and Ill Bell. 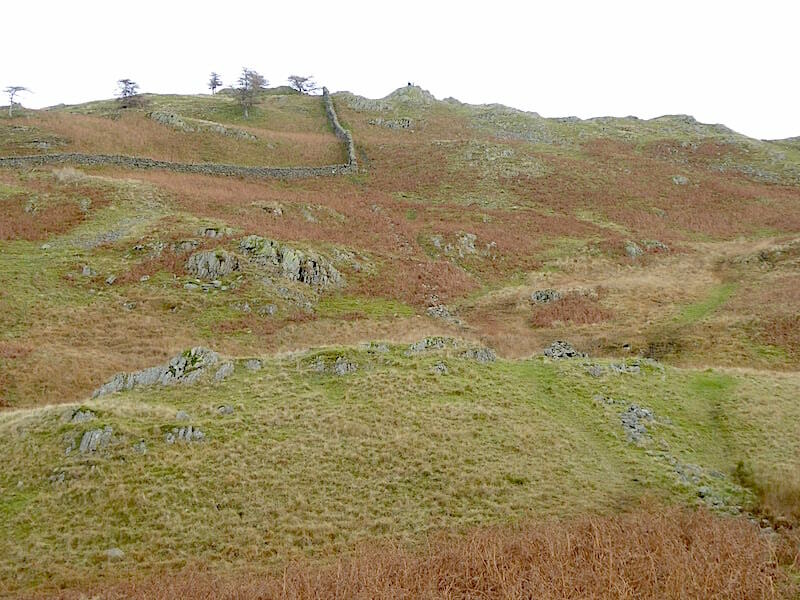 Back down from Park Fell summit we take the path on the opposite side of the tarn and above it are the two rocky outcrops where we arrived at the end of the climb up from Skelwith Bridge. No ripples on the water as there’s still not the slightest movement of air. 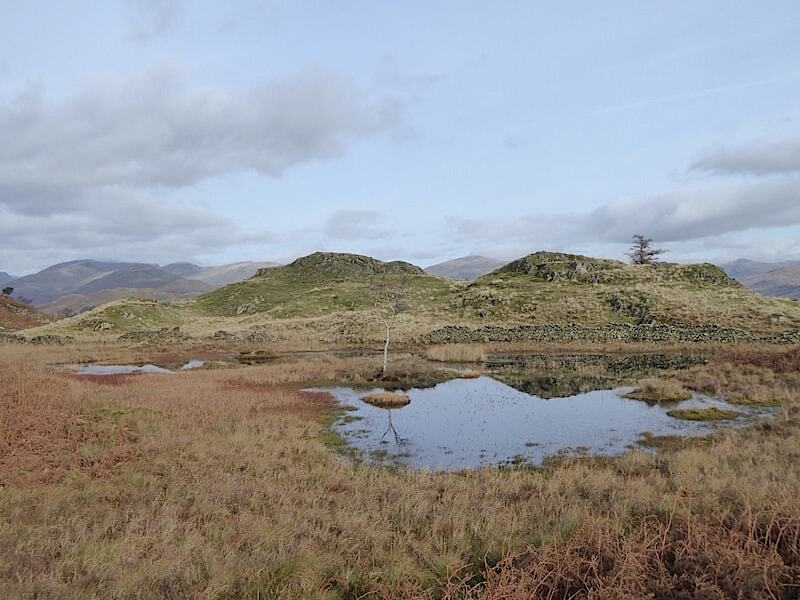 Another view of the tarn as we make our way over to Black Fell …..
….. and a look back at Park Fell from a little further along the path. The path to Black Fell is much clearer to follow and, having gentler gradients, is easier to walk so we make good progress along it. Another look over to the west show that the cloud has lifted a little over Bowfell, on the centre skyline, and although we can’t see the summit we can see sunlight on the slopes of The Band, which is one of the routes up to Bowfell. 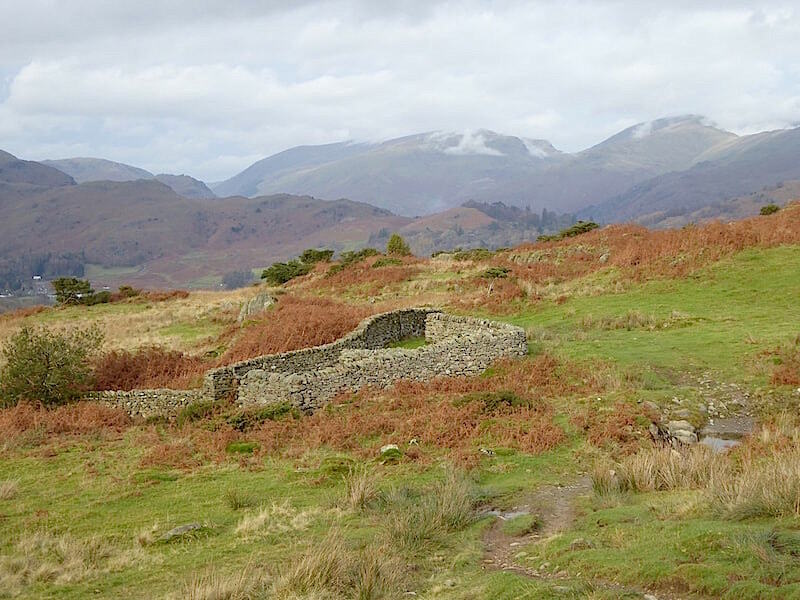 To the left of The Band we are also beginning to get glimpses of Crinkle Crags through the remaining wisps of cloud. Just below Black Fell summit are these two rocky outposts between which we can see a line of cloud streaming across the flat top of Fairfield. The light is now a bit peculiar being neither very sunny or outright dull. Fine layers of opaque cloud have crept in, almost as if a thin semi-transparent sheet is sandwiched between us and the sky, subtly muting the light and leaving you wondering whether you’re looking at blue sky or grey. 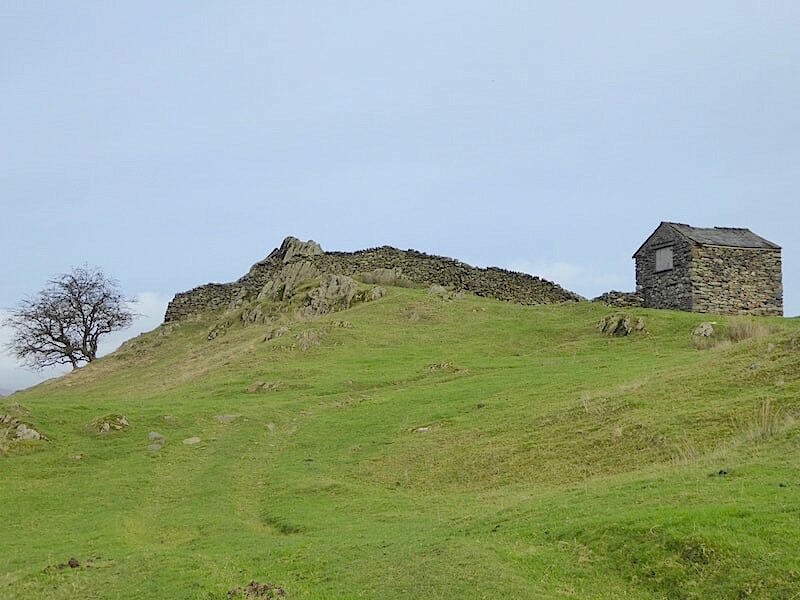 Just a few paces further is the ladder stile beyond which is the trig pillar on Black Crag which marks the summit of Black Fell. 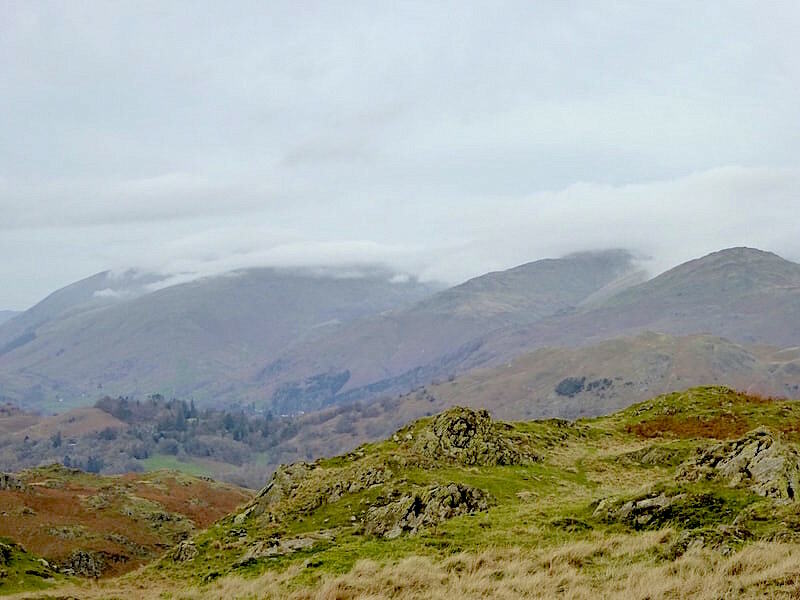 Before we cross the stile I took a look back and noticed this large build up of cloud pouring over the Helvellyn range and the Fairfield group. 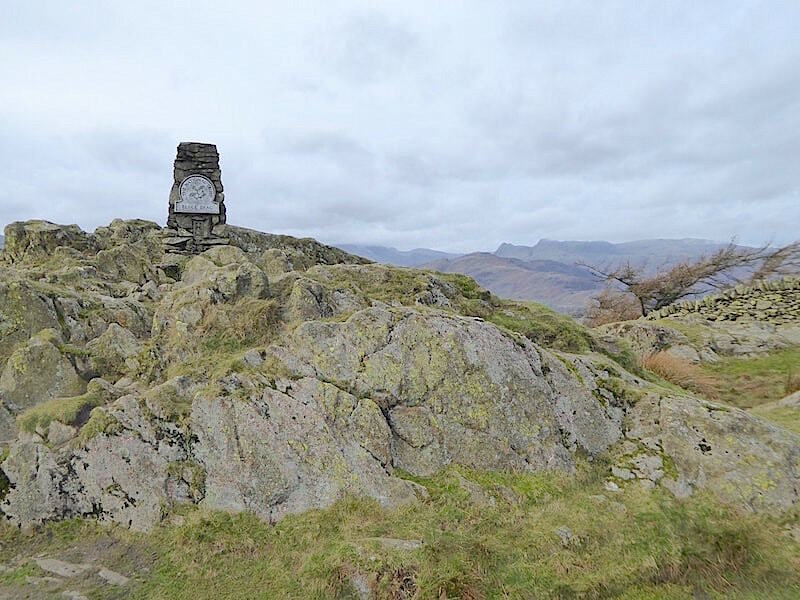 No such cloud drama over here at the trig point …..
….. although the sun has definitely taken its hat off as we cross over to the lower cairn …..
….. with a look back to the trig point on the way …..
….. together with a glance over to Wetherlam and Coniston Old Man where the cloud drama is also picking up pace. 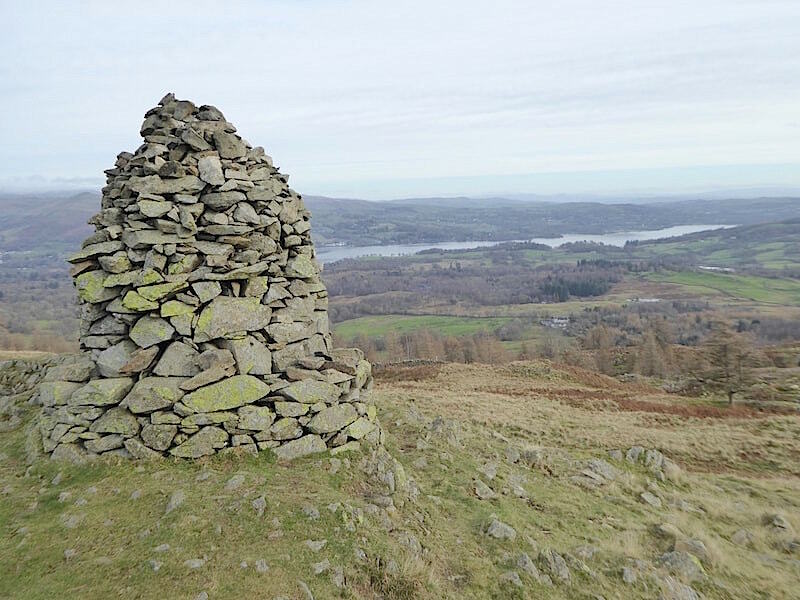 Over here all is peace and tranquility as we view Windermere from the grand and imposing lower cairn. Only the two of us here at this cairn with another two pairs of walkers back at the trig pillar so not at all busy today. 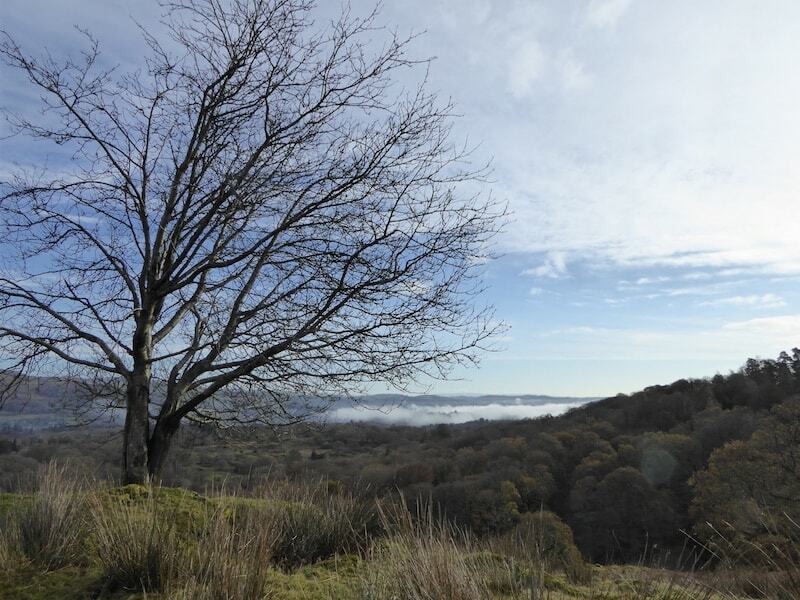 There is no longer any doubt as to the colour of the sky now, its definitely turned a delicate shade of pearl grey. From Black Crag we begin making our way down over the hillocks and assorted humps and bumps aiming for the white building below which is Low Arnside. Out of shot to the left were a few pairs of walkers making their way up from the direction of Tarn Hows but we met nobody on the path to Low Arnside. 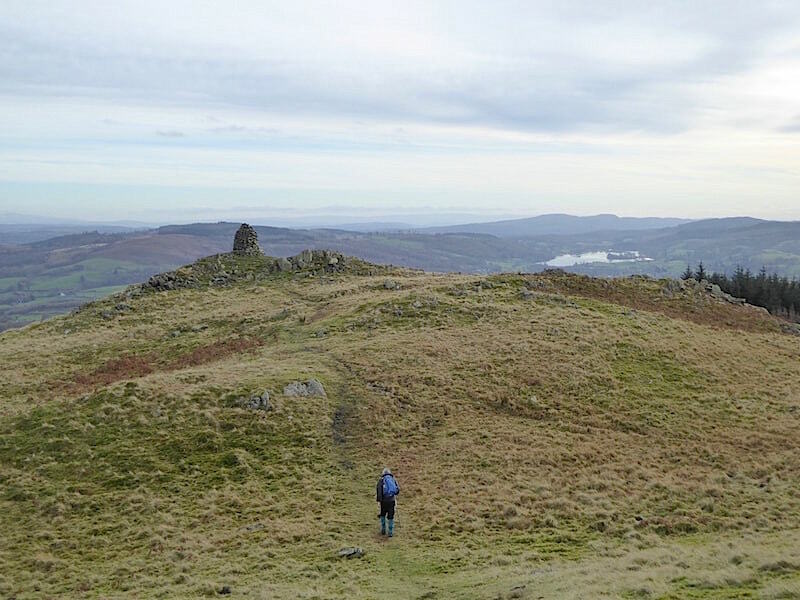 Just before we round another hillock and make our way over to the bridleway we had a look back up to Black Fell summit where a pair of walkers, clearly visible on the skyline, had just arrived at the trig point. A view of Low Arnside as we reach the bridleway. 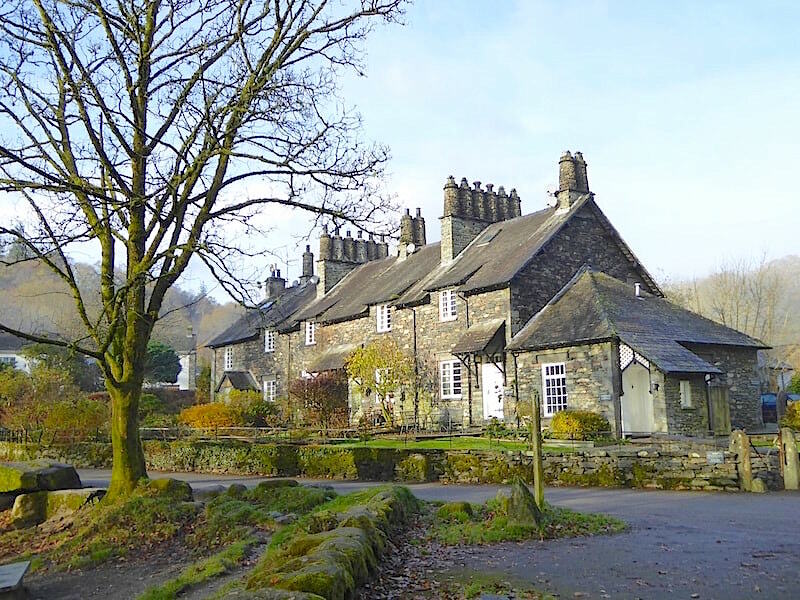 The cottage, apparently over 300 years old and owned by High Arnside Farm just a short distance away, is a holiday rental now. I wondered if it was once a tied cottage for a farm worker. 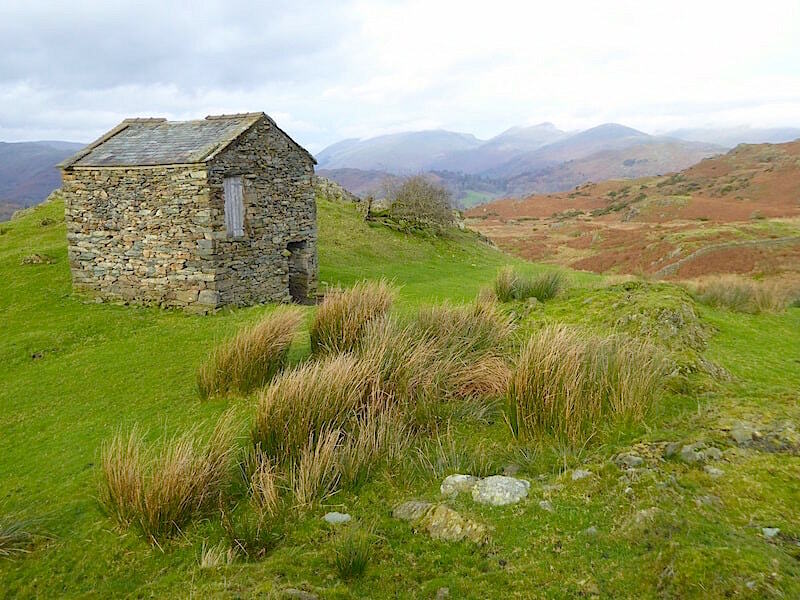 Along the bridleway we spotted this old barn above us so …..
….. up we went to have a mosey, or should that be nosey, round. We’re not good at walking past old buildings, unless they’re obviously lived in of course, and no matter what the building is, or was, we generally go over and have a look. 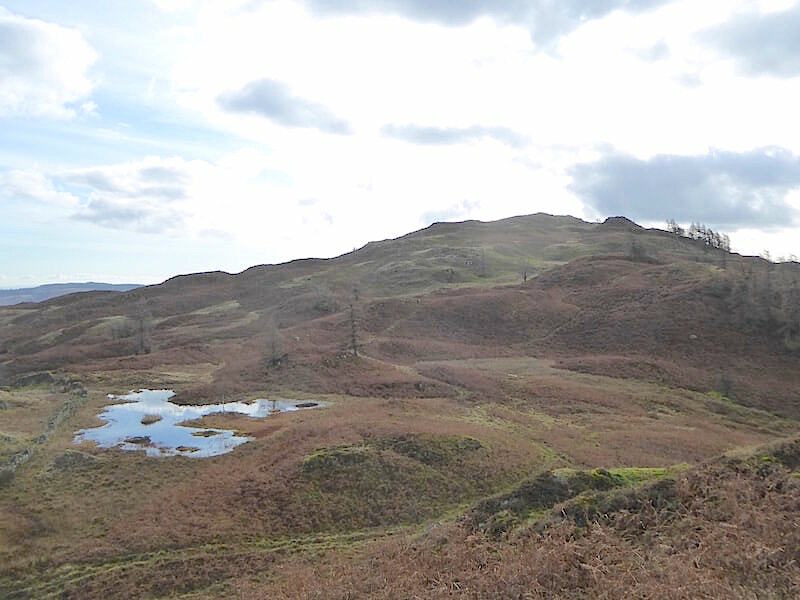 We weren’t in any great hurry and we had considered going over to Holme Fell but decided against in the end. 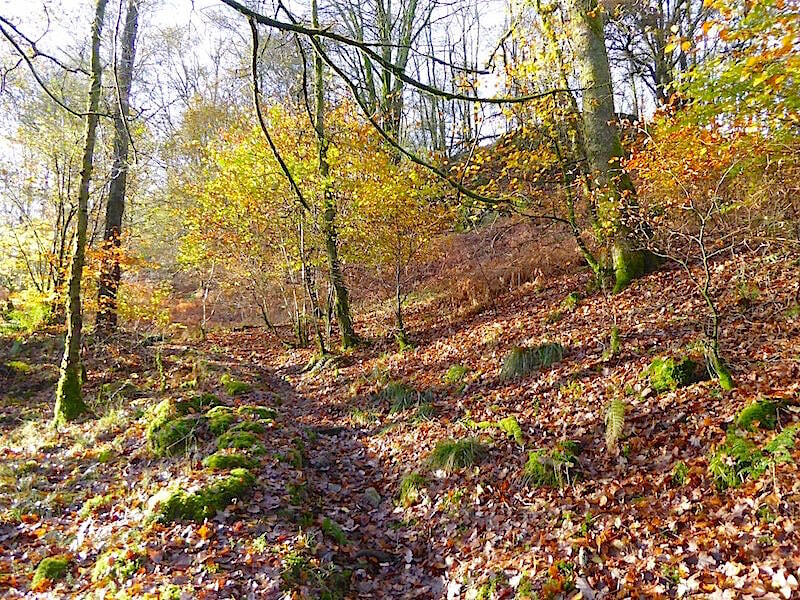 The bridleway crosses Washfell Beck beside which is this old washfold …..
….. and across which are some handy stepping stones. A pair of mountain bikers came hurtling through here with the lead rider hitting the rocky path just above the beck at some speed and coming to grief with a loud yell indicating that some part of his anatomy had felt the force of the impact. He did manage to stay on his feet and keep hold of the handlebars as the bike lurched to the ground, and after a bit of a dusting down he was back in the saddle and on his way again. The second rider took things a little more carefully. We’re on the homeward stretch now with a couple of hundred yards to go before the bridleway comes to an end. 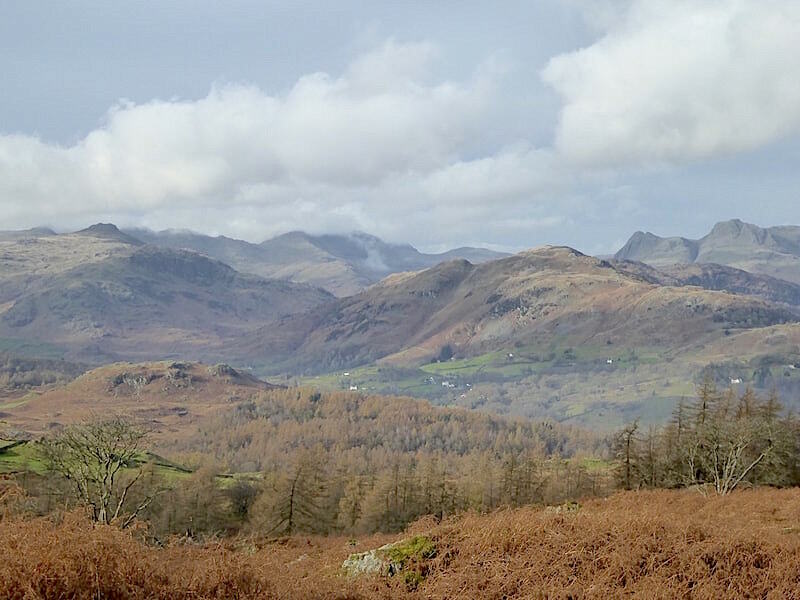 A look over to our left shows that the cloud has covered Bowfell once again and the landscape has generally lost its earlier glow. 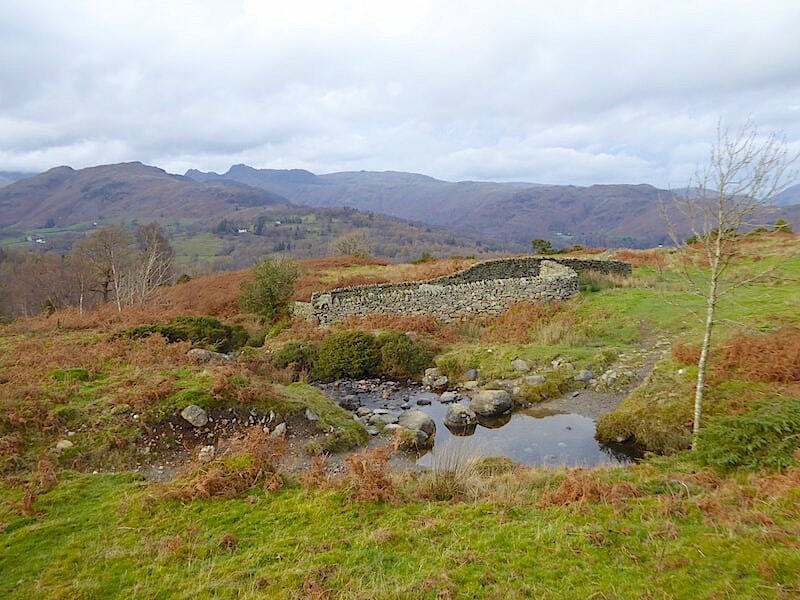 The houses at Skelwith Bridge are just coming into view below us on the right of the shot. So, we reach the end of the bridleway where it deposits us on the A593 for a stretch of road walking over to the right. Its a winding and busy road so you need to be on the lookout, especially on the bends, as drivers often forget that they will come across walkers who have no choice but to use it. 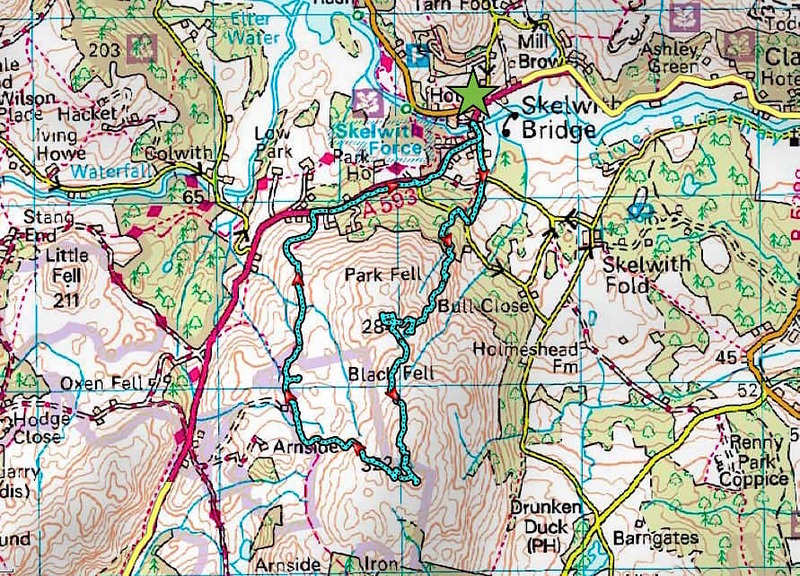 A little further along from here is a permissive path which stretches for about three hundred yards and which runs just a few feet above the road across the lower fellside so there is some degree of safety there. 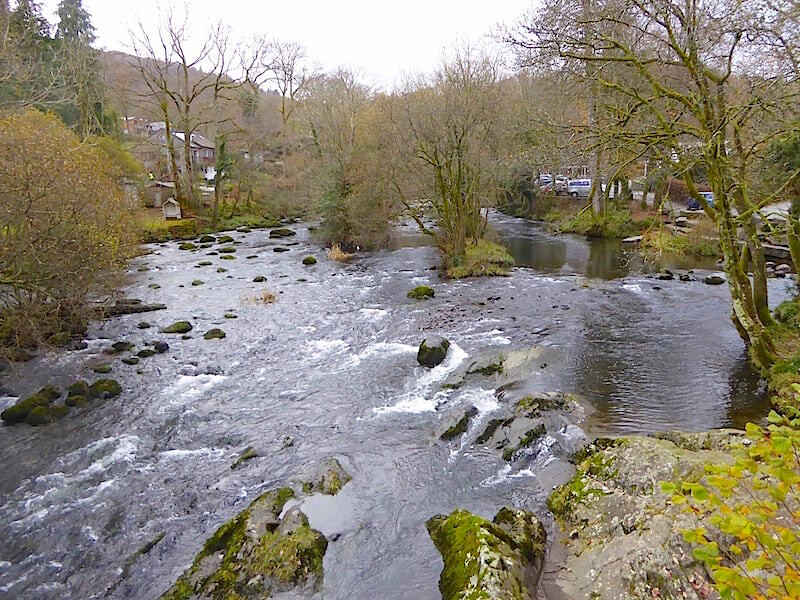 At the end of that its back to the road for a very short distance back to …..
….. Skelwith Bridge and the River Brathay, where our walk comes to an end. 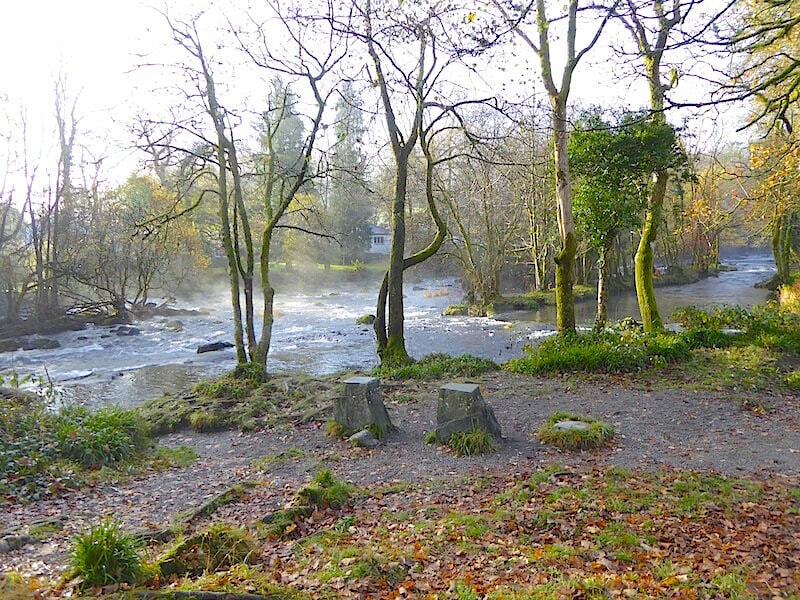 The car is parked just to the right of the shot, and in the picnic area on the river bank a couple of folk, well wrapped up in hats, scarves, gloves, boots and thick trousers and jackets, have their flasks and food boxes out on the tables and are tucking in to what could either be a late lunch or a very early tea. Whatever it was they were certainly enjoying it despite the greyness of the day. We’ve enjoyed our day too and, had it not been for the delay and detour at the start, would have enjoyed walking in the sunshine for much longer than we were able to.